On Monday night, two women watched the Men Tell All episode of Rachel’s season of The Bachelorette. This is their story. Kate: First things first: let’s get on the same playing field. Clover, this wasn’t your first Men Tell All—or was it? Clover: It was! As a first-time Bachelorette viewer but a long-time reunion show watcher, this episode really disappointed me and made me realize how much there’s an art to hosting a reunion. Bravo’s Andy Cohen plays that role well, asking the right follow-up questions, being shady and maintaining a balance with everyone’s stories. With this show, by the time Rachel stepped on stage I was emotionally exhausted from the Lee intervention, which they devoted a whole lot of time to. Kate: For those deep in the Bachelor universe, I’d suggest a listen to Juliet Litman’s recent interview with ABC’s Rob Mills, who oversees reality programming at the network, which means he’s in charge of every Bachelor program. 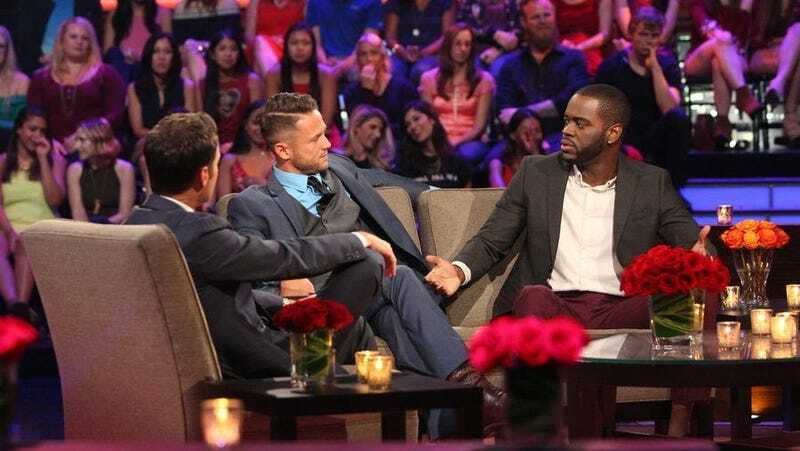 In the interview, Mills talks about a number of things—casting the first black Bachelorette, the Bachelor in Paradise situation (he’s adamant that nothing untoward went down and the whole investigation was handled completely responsibly), but in particular, he admits that they probably spent too much time this season focusing on Lee and Kenny’s fight. Which is why I found it astonishing that this special did the same. It begs the question: how worthwhile is it to watch a racist man be told he’s racist if he’s still not getting it, and our host seems to, at times, let him off the hook for his behavior? I really agreed with Kenny when he said to the audience, “If y’all thought y’all were sick of seeing it, I was very sick of living it” re: his dynamic with Lee. Clover: What Kenny said was a good summation of what it’s probably like to be a minority on these types of shows, and it was quite crazy to see this smart group of black men explain racism to an uninformed white dude. Then again, that’s exactly the problem—that they were forced to articulate what’s supposed to be obvious, which is that racism is bad. Watching all the explanations, I felt like it was a burden those guys shouldn’t have had to carry that much and Chris should’ve interjected more as a host and recognized where the conversation was going. At any rate, the guys showed they were smart enough to figure Lee out in the moment as they were filming. I loved when Anthony, the bald black dude who looks like a professor, pointed out Lee’s “invisible racism” with a nice, eloquent speech. For such a calculating character, though, Lee was surprisingly speechless and his demeanor threw me off. You could tell he had a hard time processing what the guys were saying and then articulating his own thoughts because maybe he was thinking too much about how he would be perceived. But I also don’t think he had the language to explain himself in a sensible way. The intervention felt uncomfortable, though not to where it seemed like there was progress being made. Maybe that’s just a reflection of how life works. The tiny realization that Lee had by the end is like the most realistic outcome, but getting there was mentally exhausting. While his appearance prompted some legitimately interesting conversations, ones I hope opened the eyes of the audience watching, the intro package with “best of” Men Tell All moments at the top primed me for a feeling I had the whole time, which is how the production company and the network were able to get away with casting this guy (who said things like “I’m facetious” to explain his “jokes”) in the first place. Note their rehashing of when Kaitlyn was attacked on social media for sleeping with Nick before Fantasy Suites, never addressing that the reason that happened was because they made that a plot point on the show! When Lee said “I feel like I have a lot to learn,” it felt like something the creators of this show—who still claim they didn’t know about his tweets before casting him—could take as a lesson as well. Clover: Yeah, it didn’t make sense to me when Lee said the KKK/NAACP tweet was out of context—and then no follow-up from Chris??? Lee kept saying he should’ve been a better friend, and all he had to offer were vague excuses: “I don’t like racism at all. It bothers me morally.” And “I wasn’t as considerate as I should have been in a lot of ways.” Statements that say nothing. I think the pile-on may have sparked something in his brain, I just don’t know what he’s actually thinking because he didn’t provide any meaningful analysis of his thought process. I think Kenny got at the subtext of the conversation when he made the point about his friends being proud that he was authentic on the show, whereas Lee’s agenda was to simply do something, anything interesting to get noticed. That speaks to the idea of reality contestants trying to validate their existence on the show by being villainous or playing a character. Kenny also said the guys vowed to play a “gentleman’s game.” I can’t remember if that conversation was aired, but I found that interesting. I have to talk about Dean, my fav and the guy I *predicted* would be a standout from the first episode. (I have texts to prove it.) He was an excellent mediator! He’s the one who pointed out that while the episodes were airing, Lee didn’t apologize or retract anything on social media, and there was also a moment where Dean said the conversation was “detracting” from the topic. Dean should host everything and always be on TV. Kate: I’ll admit that while Dean was not my cup of tea early on—I think it was his styling, which as we saw last night with the suede booties and patterned socks and blazer, has not really improved—everyone else who called him as a keeper was right. I mean, the man knows how to apologize, something his cast mates could learn a thing or two about. I don’t think that convo Kenny mentioned aired, but I also found it intriguing. A couple other non-race related seeds that were dropped last night: Diggy pointing out that several of the guys weren’t there (not that we would have noticed if he hadn’t; I’m sure they were all from the first night), and Dean discussing how he’s happy he got the opportunity to discuss his issues with his dad, which was a big point of contention, given how emotional their exchange was. I also thought it was noteworthy that DeMario was the only person defending Lee, briefly alluding to the fact that Lee reached out to him when the Bachelor in Paradise shutdown news broke and sent him some supportive words. All in all, I found it to be a tiring episode, if debatably more worthwhile than most of what we see on this show. Which in a way feels like the theme of the season? Clover: It definitely pointed to how unprepared the producers were to have or mediate a conversation about racism and they were clearly more focused on creating tension (which I know is their job) than discourse. DeMario… It’s good to know he’s a true herb with profoundly dumb logic. I don’t believe most of what comes out of his mouth, and his version of the story involving the other woman was totally gross. He mentioned her being a “side chick”? And made a reference to Bill Clinton and Monica Lewinsky. I have no idea what point he was trying to make and I’m sad that he has any type of platform. There was a moment when Will gave him the greatest side-eye. I also really liked the moment between Kenny and his daughter. A touching break from the craziness. It seems like they have a close bond, but I have to admit it’s still unclear to me why Kenny left the show. I know he was missing his daughter—I get missing your kid!—but he had something going with Rachel, and his reason for going on the show was to find love. Why not see that through? I thought they could’ve explored his line of thinking better. And I loved when Diggy got upset that Lee made it further than him, because that’s how we all felt. I wish they gave more time to Rachel instead of tacking her onto the last half hour. In all, this didn’t satisfy me nearly as much as a Bravo reunion episode. Kate: That’s a comparison I haven’t made before; these shows are such a beast of their own, and follow such a formula (which is usually my biggest issue with them, as that’s usually why they end up doing stupid to awful things). But you’re totally right—even though a reunion episode of the Housewives is, as the Men Tell All is, taped months after the filming of the season, it prompts reliving of emotions, and catching up about where people are now. But since the viewing audience of The Bachelorette feels as though all these men just broke up with Rachel, even though a great deal of them have clearly completely moved on—they just filmed Paradise, for god’s sake—we’re not going to get much out of them in terms of their relationships with Rachel, because they just don’t care that much anymore. As annoying as the endless Lee conversations were last night, I guess I get it—what else were they going to talk about? How they’re all very much over Rachel, who is now engaged? Clover: That’s true. It’s kinda weird that they shoot this episode before the finale, which means the top guys don’t get a postmortem with the rest? And instead I have to deal with the Whaboom guy. Kate: It’s amazing that, given his fight with Blake, they got but a mere few minutes last night to relive their feud. It’s a true testament to the cold rules of entertainment (and love, I suppose): there’s always someone else coming down the pipeline.